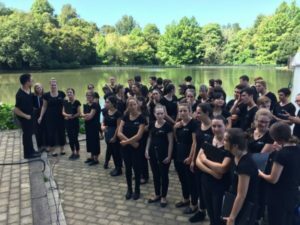 The 50 singers of NZYC live, work, study and play in the cities and towns all around our fair country, but come together three times a year for intense week-long courses. 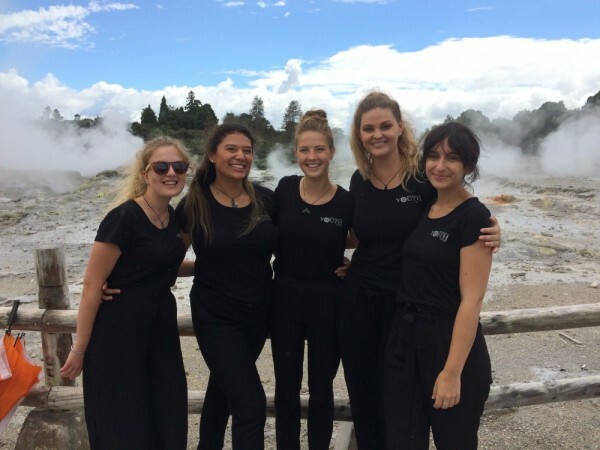 At the start there is the overjoyed re-union of the singers, the catch up and updating on the latest gossip, or, as happened this February, weather delays, cancelled flights and the singers reaching their first destination, Rotorua, over an unexpected 30-hour time window. All the fine-tuned preparation of Ops Manager Emma Billings, expertise and skill developed over her 11 years with the national choirs, goes out of the window when Mother Nature gets in the way. Thankfully, Music Director David Squire along with 23 singers who were travelling by bus from Auckland arrived as scheduled. The South Islanders, diverted via Hamilton and shuttled across to Rotorua, joined the Aucklanders with only a few hours delay. The smaller ensemble kicked off the course revisiting the new repertoire and enjoying some intense (as in ‘focussed’) sectional and one-on-one coaching with our resident Vocal Coach, Dr Morag Atchison. The days are long, often 10 hours or more, the intensity apparent throughout the day, but as David keeps saying, having that time together is such a buzz that keeps everyone going. With the rest of the choir arriving on Monday, there was not much time to bring the sound of the choir back together. 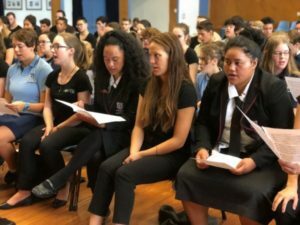 On Tuesday morning a bus took NZYC to Western Heights High School for a combined workshop with more than 40 singers from 4 schools. Here is where these Eureka moments occur, and young singers form their life-long love for singing. You have to understand that NZYC is a choir of extraordinary sound, a level of excellence that has seen them win prizes all around the world. Hearing this sound in action, sitting among the singers, is an experience similar to young rugby fans meeting their All Black idols. As a nation we fight well above our weight, like in rugby, yachting, equestrian and yes CHORAL SINGING! More rehearsals in the afternoon and Wednesday morning before heading off to Te Puia, The Centre for New Zealand’s Maori Culture and geothermal wonders. It’s one of these moments to connect with tangata whenua and to understand who we are as New Zealanders, hear the stories and realise that as NZYC we play a significant role in retelling these stories and explaining our identity through music and waiata. 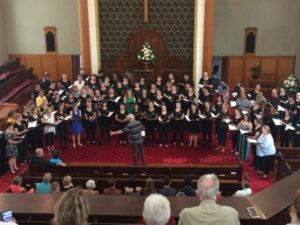 The spirit of this visit elevated the senses of the singers for the next couple of days and poured out of the choir during their formal concert at Rotorua’s St Lukes’ Church. On Friday NZYC travelled across to Hamilton for a free lakeside concert as part of the Hamilton Gardens Arts Festival and onwards to Auckland that evening. 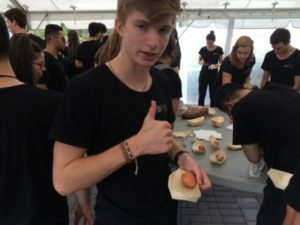 An experience of a different kind was in store for the choir the next day. For the first time in its near 40 year long history, the choir visited a prison. Why did we do this? We know what singing can do to people, audiences and participants; the health and well-being aspects, but also the feeling of bliss one can experience when listening to choral music. Well, not everyone finds their way to a choral concert, can’t afford it, doesn’t know anything about it, would never think of attending, or simply can’t. We didn’t know what to expect and how the choir’s music would be received, but we jumped through a lot of hoops determined to find out. And find out we did. We entered a solemn space, full of serious looking prison guards, concrete walls, barbed-wired fences and security cameras everywhere. There was a hushed silence and respect for the unknown. Then we entered the gym and a group of women in jogging pants and different coloured sweatshirts were waiting for us. These twelve women were the ones that meet regularly to sing together at the prison and were to join the workshop part of our visit. A shy welcome from both parties, quickly realising, we speak the same language, we are from the same country, but presently living in different worlds. Morag encouraged a small vocal warm-up routine into which the prisoners quickly found an entry point due to Morag’s wonderful, fun-filled style of getting people to sing and discover where their sounds ‘come from’. Deputy Music Director Michael Stewart then took over and introduced the spiritual ’I’m gonna sing’ to the group and after a short time choir and inmates mixed together into an ensemble and sang together as one. Interrupted by an emergency call-out to the guards ‘something had happened at High’ (as in high security section), more of the female prison population joined the singers at the gym for a mini concert. No one knew what to expect from each other, but the mighty force of NZYC flying into song hit the audience in a wave of aroha, humanity and joy – a mixture so potent, pure and honest, that not a single soul in the space was left untouched: inmates, guards, choir staff and singers. And as it only happens in a live performance the emotions of the audience bounced back to the choir and elevated the singing to a higher and higher sphere, culminating in a heart-breaking rendition of Waerenga-a-Hika that made the inmates burst into a haka to reflect their emotions and gratitude to this unconditional gift that had come their way from the choir. The mood was very different when walking back through the high security gates. Walking through the metal detectors in single file, the choir again fell into song, I don’t know who started it. The stern faces off the prison guards evaporated, the power of the human spirit had prevailed. Riding on the excitement of the morning, the choir joined The Graduate Choir NZ at Pitt St Methodist Church for a workshop and informal concert. This was a meeting of alumni and friends, colleagues and fellow choristers that renewed their appreciation for what an amazing treasure this New Zealand Youth Choir is. The next course will see NZYC travel through Central Otago and Southland around ANZAC Day in April. The year will finish in September in Wellington, when NZYC will be joined by three local choirs for a big celebration of choral singing at the Opera House.